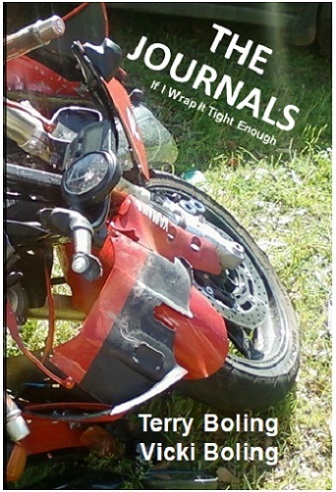 Originally meant as a supplement to Vicki's tales of motorcycling adventures in "If I Wrap It Tight Enough," this book has merit for anyone involved in an accident causing bodily harm. With a prior motorcycling accident resulting in almost no compensation to Vicki for the paralysis of her left leg and other life-long injuries, Terry and Vicki were more prepared and informed years later when she was involved in another collision with a car. At the advice of their lawyer, Terry and Vicki kept journals of their innermost thoughts and feelings describing how this hardship affected the whole family. Read about the extent of Vicki's injuries, complications with the healing process, the decision to settle out of court or go to trial, and other thought-provoking experiences. Back to the The Journals: If I Wrap It Tight Enough Main Page.